Dozens of medals hang from colorful ribbons in the hallway of Karen Ringheiser’s modest home. As she sorted through them one by one, they clinked against one another, creating a melodic chime. Ringheiser’s broad smile gleamed as brightly as the light bouncing off her medals as she spoke about her accomplishments. The small shrine is a testament to the 13 years she’s been running in marathons across the country – Big Sur, Vermont, Hyannis, Olympia. Among them, one name that stands out. “The Boston Marathon has always been very important to me. 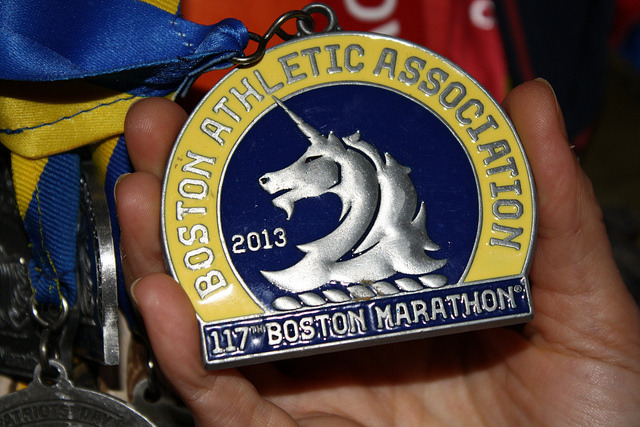 We are Boston Strong and we are coming back,” she said, looking down at the medal from last year’s race. 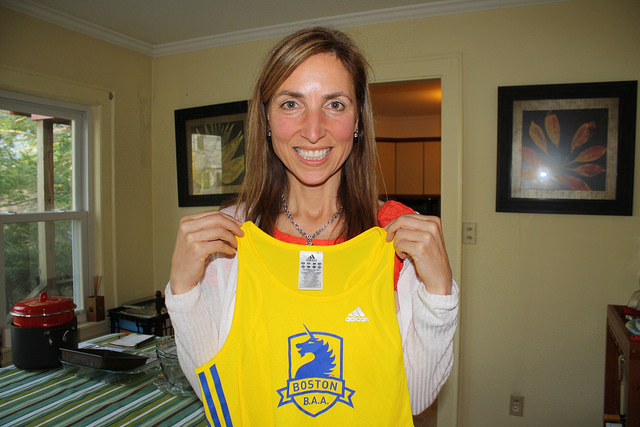 Karen Ringheiser, 50, displays her tank top from this year’s Boston Marathon. Photo by Rajeev Dhir. Although a full year has passed since tragedy hit the course, Ringheiser said she is still haunted. Two bombs rocked the finish line last year, exploding within seconds of each other hours after the winners finished the course. Three people were killed and an estimated 264 others were injured. As part of her training for the marathon this year, Ringheiser said she stopped listening to local and national news coverage leading up to the race to keep her emotional and mental well being in check. “I did suffer post-traumatic stress disorder,” the 50-year old Newton, Mass resident said as she recalled the events from that day. Ringheiser finished the race 45 minutes before the first bomb went off and was not hurt. She left the VIP tent with her boyfriend when thick smoke filled the air and throngs of people began to swell up the finish line. Karen Ringheiser holds the medal she received after completing last year’s marathon. Photo by Rajeev Dhir. Anniversaries of trauma are always very difficult for complex reasons, according to Jason Mihalko, a Cambridge, Mass. based psychologist. Mihalko said the trauma after events like the Boston bombings can be severe. Some of the symptoms include reliving the events from a traumatic experience, unwanted dreams about the event, emotional distress, changes in mood and behavior and severe emotional distress. Another common sign is the avoidance of activities and places that remind those who suffer from the disorder of the event. Former Boston College student, Rayna Aivazoglou stopped running altogether. She participated in last year’s race for the first time. Aivazoglou, now an NYU student, said fatigue forced her to lag behind her friends after they reached the top of Heartbreak Hill, believed to be the toughest part of the 26.2-mile course. She was separated from her friends, one of whom lost her leg after the finish line explosion. “It’s like a smell that brings back that nostalgia,” said the 21-year old, who now takes dance classes as a substitute for her daily run. Many people taking part and observing said they felt a heightened level of anxiety leading up to the race, even with the added security measures. Spectators were encouraged not to bring items like large bags, backpacks and strollers to the marathon. The Boston Police Department increased its uniformed and undercover presence along the length of the marathon route and added more than 100 cameras along the Boston portion of the race. “There was one moment when I pictured myself running down that finishing strait and imagined myself in that situation,” said Bauer, who ran the marathon for the second year in a row. Similarly, Pedicab manager Christian Matyi, 42, said seeing and hearing helicopters in the air added to his anxiety. Not everyone who lives through a traumatic event like Bauer and Matyi develops PTSD, because they are able to cope and heal on their own. For those who have symptoms, Mihalko suggested reaching out to a trained counselor, developing a support network and continuing a daily routine. For Ringheiser, therapy came in the form of running – dropping out of the race this year was never an option.